‘Too much of anything is bad’ – so says the age-old wisdom. Does it apply to education as well? Last week Bill Gates tweeted this chart to encourage students to complete college. I love the simplicity, completeness and elegance of the above chart. The message is pretty clear – ‘More school means more income’. But look at the chart more closely. You can see up until the Professional degree, more school results in proportionally higher income and lower unemployment. Something interesting happens at the next stage. 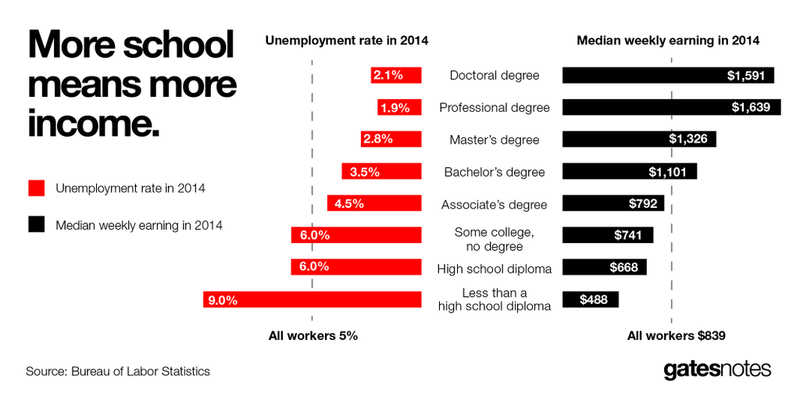 At the Doctoral degree, income starts to decrease and the rate of unemployment goes up a bit. Looks like education and knowledge also follows the universal ‘Inverted-U curve’. Money: Scholars who research happiness suggest that more money stops making people happier after they exceed $75,000 income level per year. There are stories of how parents with excess income end-up raising troubled children. Class Size: Contrary to the popular belief smaller class size results in better learning and smarter kids, as the class size decreases beyond a particular level, learning effectiveness decreases disproportionately. Apparently the optimum number is within the rage of 18-24 students per class. Punishment and Crime: Past a certain point, cracking down on crime and locking up people stops having any effect on criminals and even it makes crime worse beyond such a point and juvenile delinquency rate increases. 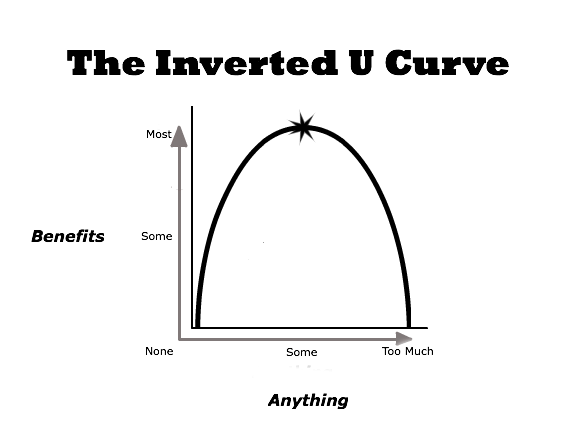 If you think about it, many things in life follow this curve – food, diet, medicine, exercise, drinking, pleasure, luxury, etc. Beyond a particular point, these things start to hurt badly. Even from an organization and career perspective, the things that got you to a particular level will not get you to the next level. The products that were once a cash cow for a company will become the reason for the demise of the company after a while (e.g. Kodak, Blackberry, Blockbuster, etc.). 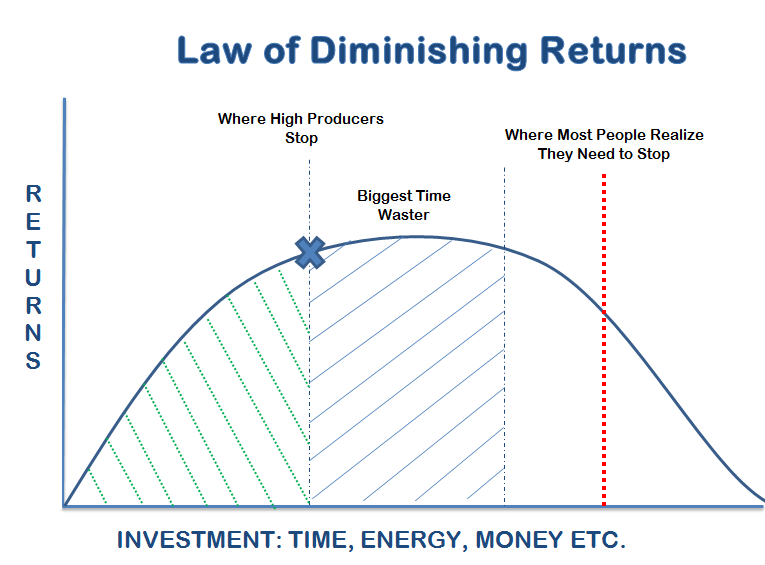 “The additional benefit which a person derives from an increase of his stock of a thing diminishes with every increase in the stock that already has”. In conclusion this paper says – There is no such thing as an unmitigated good. All positive traits, states, and experiences have costs that at high levels may begin to outweigh their benefits. This paper also reminded me of an advise I once received from my mentor. While working on a project, my team brought in a lot of academic insights to make a recommendation and my mentor then the project sponsor said “academic insights beyond a particular point though accurate becomes irrelevant”. Then – how much is too much? Its really hard to answer that question because we are asking a partial question. The complete question is – What is the goal and how much is too much? Given we started our discussion with education, if the goal of education is to make more money, then surely getting more degrees will hurt after a particular level. You just become overqualified and there are fewer jobs out there for the highly qualified. However if the goal of education is to get a better understanding of the world we live in and gain wisdom, then, an entire human life full of education is just a drop in the vast ocean of what’s out there to learn. The more you know, you will realize how less you know. ← AVOID STUPIDITY… at all costs!